A handcuffed suspect who escaped from custody by climbing an 8ft (2.4m) fence has been recaptured. 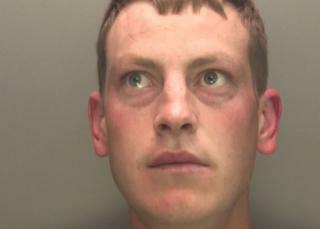 Aurimas Butkys ran off shortly after he entered Boston Police Station in Lincolnshire on Thursday. Lincolnshire Police, who described the escape as "an embarrassing event", said Mr Butkys was detained in Kent on Sunday. The 25-year-old was arrested on an extradition warrant in connection with an assault in Lithuania. It is also alleged Mr Butkys assaulted a police officer during his escape. The force said inquires were ongoing into the escape and the assault. Describing the escape as "embarrassing", Supt Phil Vickers previously said: "Officers have to make an assessment as to what the proportionate use of force is against someone who has been arrested - and in this case we got it wrong."